In our media-saturated society, images of young women are everywhere. Advertisements, fashion spreads, television shows and movies all provide us with a million pictures of what youthful ‘beauty’ and ‘style’ should look like. But how often do we see images depicting women over the age of fifty? The idea that it is only younger women who we should want to look at, and hear about, seems pervasive in so much of our culture. The documentary Advanced Style, based on a blog and book of the same name, is a colourful rejection of this tired cultural norm. The film brings to life a project by Ari Seth Cohen, a young New Yorker with a special bond with his grandmother. Living in the Big Apple, Cohen saw the beautiful, bold and innovative style of many older women and thought they deserved to be seen. What began as a simple blog has now become a sensation, one that dares to defy the notion that fashion and its pleasures are reserved exclusively for the young. In this film, we meet some fascinating and vibrant women with fashion sense unlike what you might expect to find in glossy magazines. Among others, we meet Joyce Carpati, a widowed woman with a healthy collection of Chanel bags that she plans to pass on to her granddaughter; Jacquie Murdock, a former dancer at the Apollo Theater; and Ilona Smithkin, an artist in her nineties still teaching classes and showing her bold style to the world. The film follows these and several other women in their daily lives as they reflect on their experiences and explore the new opportunities the Advanced Style blog has brought them. At first the film seems simply light and fluffy, but as we are let into the world of these women it becomes so much more: a celebration of lives well lived, of the wisdom of the older generation, and of all the possibilities that life still has to offer. The standout character is Ilona Smithkin, with her infectious smile and uniquely colourful style. Ilona clearly feels her body is beginning to fail her (she says she no longer buys green bananas as they are too much of a long-term commitment), but she carries on living with panache anyhow. It is this refreshing approach to ageing and self-expression that gives the film so much substance. Each of the women featured has a zest for life that jumps off the screen. We gain insight into their life stories, which are inspiring, sad, and interesting all at once. There are a few particularly poignant scenes, like the one in which Tziporah Salamon talks about missing out on marriage and her hopes to one day meet someone and be a mother to their children. In another, a customer tells Lynn Dell, the owner of Off Broadway Boutique who also features on the blog, just how much she has been inspired by Dell’s style. We often seem to punish women who do not take to an all-grey ensemble on the day they hit fifty, suggesting they should “dress their age.” Instead, this film celebrates the fashion of these women. Their style is something to aspire to, not laugh about or cringe at condescendingly. 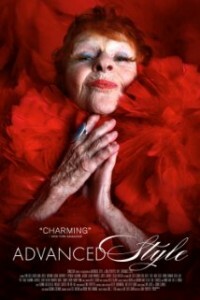 This documentary not only shows that fashion and style can be wonderful expressions of individuality for people of all ages, but it also reminds us that life doesn’t end just because you are no longer part of Vogue‘s target demographic—growing older does not have to mean dressing in grey and staying out of sight. This entry was posted in Film and tagged film, film review, Review. Bookmark the permalink.